ADEX judges are among the A&D industry's most respected in their respective areas of expertise. 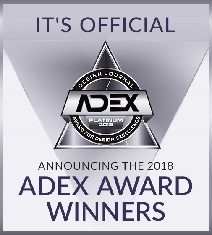 The ADEX Award represents the best product and project designs of the year in the opinion of those who matter the most. Each category has potential for three award levels of platinum, gold or silver. Judges award points in several categories for each entry. Total points earned determine each product's score. Minimum scores are needed to qualify for each award level. Winners are announced each April in Design Publications. 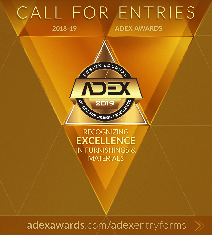 The ADEX Awards is clearly the largest and most prestigious awards program in the design industry and this year promises to be the biggest and best ever - by far. Our annual programs take the stress out of submisson deadlines. Your annual program begins the day you submit your entry form and effectively renews each year on the anniversary date. The benefits of entering ADEX begin the moment you upload your product images and descriptions to adexawards.com and designjournalmag.com. Nomination Submissions: All nominations entered by December 31 of the current year are judged the following January and announced that April. All nominations submitted after December 31 of the current year and prior to your effecive renewal date are judged the following January after you submitted and announced that April. No matter when you submit your nominations you begin reaping the power of ADEX immediately! Entry and submission deadline is December 31.